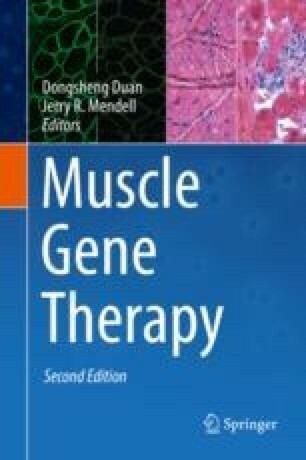 Muscle is a major target tissue for gene therapy, in part because various gene delivery vector platforms enable in vivo gene delivery to muscle tissues. Among them, recombinant adeno-associated virus (rAAV) stands out as one of the most safe and effective vectors for human applications. Many AAV strains isolated from nature collectively constituted the vector toolbox for muscle gene delivery during the field’s early development through animal studies. Caveats emerged as these vectors were carefully evaluated in clinical applications. As the research community has accumulated knowledge about basic AAV biology and the nature of human-specific hurdles to translational therapy, AAV capsid engineering has emerged as a powerful approach for modifying naturally occurring AAV to better address the challenges in human muscle gene therapy. In this chapter, we first introduce basic AAV biology that pertains to the vectorology of AAV for gene therapy. Next, we summarize how AAV vectors based on natural isolates contributed to the continuing success of human muscle gene therapy. Finally, we discuss the protein engineering approaches that have been applied to AAV capsid to develop better clinical vectors, namely, rational design and directed evolution. Authors Dan Wang and Alexander Brown have contributed equally for this chapter.